Just a short update. From all accounts Gene is doing well and is in excellent spirits, which is the best news possible, and spends his days just relaxing, gathering strength, working on art and watching Gary Cooper movies. Clifford Meth's auctions are still running so visit his site and spend, spend, SPEND!! it's for a damn good cause, of course! Remember, there are eBay auctions, the highlights of which are the stunning Walter Simonson drawing and an original V For Vendetta page by David Lloyd. Well worth buying. With the release of the recent Essential Hembeck Omnibus Archive I thought it'd be a tad interesting to look at a different side of Hembeck - the Coloured Hembeck. The format of the Hembeck Omnibus meant that, outside of the cover, no colour material would be included, and that's a large shame. Still there is a load of colour Hembeck out there but what's rarely seen is Fred's contributions to The Comic Reader. Well it seems our pal has once again changed his name. Read the latest comment here. Now he's Brown Douglas Jeff - interesting in a way because with this new name he can use multiple combinations and variations. The emails that he sent were strikingly similar to the ones that trapped us, so keep spreading the word and remember - if an accommodation deal in New York looks too good to be true then it's a rip off. Pure and simple. In the meantime spread the word and link/share the post. I estimate that we've now cost this guy in excess of $40,000 already - possibly more. So sure, he got our $4,000 but he's losing a hell of a lot in the meantime. No word from the US authorities, despite many claims being made, but one day someone might get off their fat arse and do something about this cretin on the ground in America. I love this kind of stuff. Seriously I do. I stumbled across this little ripper over the weekend as I was collating data for insurance purposes regarding my collection of original art. 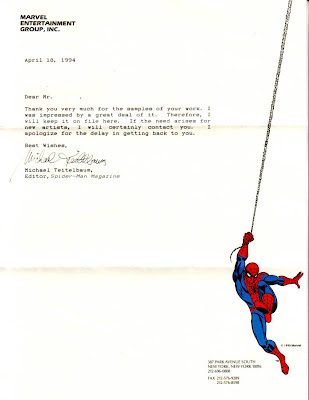 What you're looking at here is a genuine, mid 1990s Marvel Comics rejection letter. You can say what you like but I'm telling you, no matter how it's dressed up it's still a 'DCM'*. Go ahead and click on it. It's short, sharp, to the point and a bit misleading, but in a good way. How do I know it's misleading? Easy - the artist who sent me this (I'm not going to name him, I'm sure he's aware of who he is) has never worked for Marvel, certainly he's never worked on Spider-Man. He's done his fair share of commissions featuring Spider-Man and they're damn good, but he wasn't deemed good enough to draw the character at the time.